As a team who are experts in this local area, we bring a wealth of knowledge and expertise about buying and selling real estate here. It's not the same everywhere, so you need someone you can trust for up-to-date information. Jan works with our team to help our clients find the perfect home and take our customer service to the next level! Savannah manages office procedures, marketing, and the magic behind the scenes! From setting up escrow to tracking your transaction, she will keep us on schedule. "Denise’s Team was a breath of fresh air and I am fortunate to have had the opportunity to have such a Top Notch Crew watching out for my best interests." "You guys make buying a home super easy. I didn't even have to take any days off work and you guys ran on my schedule. I appreciate everything you guys did Thank you :)"
"What we enjoyed most about working with Denise and her team was their consistency, transparency, timeliness, and great communication." "We were really nervous about the whole experience, it being our first home, but Denise and her team were there for us through the whole thing! It was great having someone so honest and knowledgeable. We also really appreciated how easy it was to get a hold of them with any questions or concerns we had. They were amazing!" "We really appreciate your patience and helpfulness! Your team really helped make our experience as smooth as possible"
"We did not have the usual house sale. We had many bumps in the road along the way and at one point thought about throwing in the towel with our house sale because of the unusual circumstances. Denise and her team did not give up on it or us and we are so happy at this point because of that. With their help we are able to move into our dream house." "All together amazing and on top of it at all times." "Denise Christofferson & Associates, which included Jan Gomez, were customer centric, knowledgeable, professional, organized, and personable. We found and closed on the home that we wanted--and we couldn't have done it without them!" "Denise is great. We have used her multiple times." "Our experience with Denise Christofferson and Associates was outstanding. This was our first experience selling a home and Denise was right by our side talking us through the process each step of the way. We can't imagine how it might have been better." "Your team has now helped me with three of my families homes and each and every time, it was a good experience and I thank you all very much." 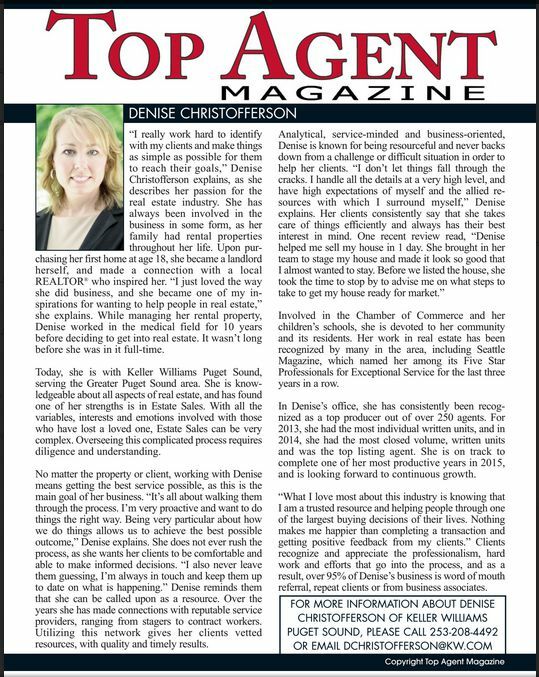 "If you are looking for a truly professional realtor, I highly suggest Denise Christofferson. She is knowledgeable, prompt, thorough and very well respected by her fellow professionals. She knows the market incredibly well and has insight into how to make an offer that stands out giving you the buyer perhaps a slight advantage in a tough market condition. I would hire her again and again. In fact I have and she has never let me down. I am impressed and I know you will be too." "Very responsive, did an excellent job marketing my home for sale, highly recommended!" "You have gone above and beyond. We have been very happy with what you’ve done!" "The thing I enjoyed most about working with Denise and her team is the ability for us to be mostly hands off and not stuck in the details." "Denise and team did a great job guiding me through the selling process. Her team kept me informed and provided great advice when the buyer’s lender caused some bumps in the road. In the end, we successfully closed because Denise and her team pushed through all the obstacles and made it happen!" "We were first time homebuyers, and this process was made so much simpler by using Jan and her team. Everything was explained clearly, all our questions were answered, and the process was incredibly smooth." "What we enjoyed most about working with Denise Christofferson & Associates is that they are a hardworking team that looks out for our best interest." "Denise is exceptionally committed and astute. She knows what to do in every changing situation and communicates calm and confidently. This is probably my very favorite thing about working with Denise. The weekly update emails from Savannah were very helpful too!" "I am a person who needs to be informed at every step. I received this kind of service and it really calmed my nerves about the whole process. Denise and Savannah were AMAZING!!!" "My sale went smoothly, staff was knowledgeable and helpful." "Jan is an expert Realtor. Thinking outside the box and cautious about hidden dangers. We got a great house at a very good price. Denise's details were a very nice touch. Great communication from everyone on your team." "Denise is very attentive to detail and to the next step in the process. She seems low-key but she doesn't miss anything. She is a pleasure to work with. Savannah does great followup." "Denise and her team were very helpful and knowledgeable throughout the whole process." "Denise and her team helped us throughout the process of selling our home, finding a new home, and assisting us through the closing process on both the sale and purchase. Denise's advice on everything from how to stage our home for photos and showings, to her knowledge and analysis in setting the correct selling price of our home, and referring us to a great mortgage team were invaluable. We can't wait to start making new memories in our new home." "My Capitol Hill condo closed last week, and I am so fortunate to have been referred to Denise and Jan! As a first time seller, Denise put me at ease and her team was always in contact with updates. My first accepted offer fell out of escrow (due to the buyer having first time jitters) and I had another accepted offer the next day. I sold for way more than I anticipated. You can't go wrong with Denise and her team." "Denise was great to work with! She was very responsive and addressed all of our concerns. She made the selling process a breeze." "I was pretty nervous about selling my home. I was referred to Denise through a friend, and could not be more glad that I decided to go with her. Denise kept me in the loop the entire time, and was always available to answer questions. I don't think I waited more than 10 minutes for a response from her (even when she was on vacation). We had a couple rough spots with our buyers, but she navigated through them expertly. I think I would have had a much harder time with the sale with any other agent. If you're looking for an honest and friendly person to help buy/sell your home, go with Denise and her team. You won't regret your decision!" "Out of state sale much smoother that I could ever imagine. The house was fixed and lawn was taken care of without my presence. Excelling communication during entire time, and getting everything done promptly, without any delay. Overall, excellent job!" "We had a long search to find the right home for our family, but Denise never gave up on us and we finally found a house we could call home." "Denise and her team provide a perfect balance of professionalism and a personal interest in her clients." "Denise was very knowledgeable and reliable. Knows the area well. The sale went very fast and smooth. Denise was always there for us. Thank you so much." "Denise was great to work with. She really let us take our time to find the perfect house for us. I would recommend to anyone who is looking for a local realtor who's honest with none of the hard sell." "Jan and her team at KW were FANTASTIC!!! We wanted to sell our home and purchase a larger one. Our timeline was two years - not because we wanted to wait; there was just a lot that needed to get done and we had no idea where to start. Then we met Jan and Denise. They advised as to which repairs and updates did not make sense, provided referrals for those that did, and even supervised work while we were out of town. Three weeks later, our home was listed, and sold for top dollar within five days. In the meantime, Jan helped us find our dream home. She took the time to find out what we wanted, provided us with listings, answered every question - there were a lot of them - and made sure we understood our options. In short, their expertise and hard work transformed our two year timeline into less than two months from start to finish - and we could not be happier with the outcome!! !Thank you, Jan! " "My family loved working with Jan and her KW team! Professional, friendly, and thorough are just a few of the many exceptional traits Jan exemplified to help us find our new home! We fully recommend Jan to anyone looking for a home!" "A BIG Thank you to Jan and Denise for helping my husband and I venture into the exciting world of real estate investment properties! Jan was such a go-getter and understood that we needed the "numbers" to make sense on a home before purchasing, so she helped us narrow our search to fit our criteria! They also made the process all the way through closing so easy and understandable - we were never guessing about what was coming next!!!! Thank you again for all of your hard work! We would recommend working with Jan and Denise to anyone looking to have a great real estate experience." "The home buying and selling process has been historically difficult for most. We were not looking forward to the complications that we had heard from many friends and family. Denise has a calming and organized manner about her, and Savannah is very pleasant and organized as well., The whole team has made this a painless process and we would certainly use them again and recommend our friends & family!" "We met Jan at an open house. She was super responsive and interested in meeting our needs. 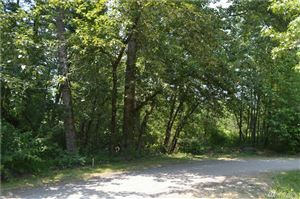 We decided to give her our business and she helped put together a great strategy for purchasing our investment property." "We've worked with three other realtors directly in the past, and another four indirectly through these previous transactions. In each past instance, I have experienced a lower quality of: service, experience, engagement, expertise or character. My goal in working with team Christofferson, is to reach the end of the transaction process and have such a great experience that I would want to repeat business in future. We're on track to reach this goal! We have really appreciated the process preparation of the team, to meet us at each step of the transaction, with timely information. In addition to printed or digital supplemental content, regular communications have been more than supportive: weekly email summaries with milemarker bullet lists; personal email and phone calls or text regarding anything that comes up, support with meetings between other parties. In all--WONDERFUL! Plus the team is made up of some very likeable personalities!" "Denise and her team work like a well oiled machine. Their expertise and professional communication made the selling process easy with very little work on our part as the sellers." "Denise and her team made the home-buying process a very streamlined, fairly stress-free process. I truly feel she was an advocate for us, focused on finding us the best house for us and in our budget." "You guys made our house buying experience so much less stressful and just an overall awesome time." "I have referred Denise to several people, including my own mother. She and her team have always done a fantastic job!" "Everything went very smooth and professional. Felt like they watched out for our interest." "I love that even when I was ready to give up they were not! I am so thankful to have worked with such an amazing team!" "I had an seamlessly awesome experience! Denise is not only VERY good at what she does, she's a wonderful person who I'm honored to call my friend now. I so appreciate your whole team for your hard work and expertise. We are totally in love with our new home!!" "The things we enjoyed most about working with Denise and her team were the communication, always keeping us updated, and how well everything was organized. We would definitely use Denise again!" "Your team has been incredible to work with, sold two of our properties in record time, one when we were out of state, and you handled everything! We have sold many properties in our lifetime, but never with this level of professionalism."